Prioritize building a nurturing culture, give your people meaningful and challenging work, solicit and implement their suggestions, and offer work flexibility. Attracting and retaining employees are two vital challenges that businesses face. The quality of your people determines the quality of your organization’s work, so it pays to have happy, engaged employees. 1. Focus on culture and leadership. A survey by Glassdoor found that employees esteem “culture and values” far more than compensation when it comes to job satisfaction. The importance of culture also increases as employees ascend the corporate ladder. 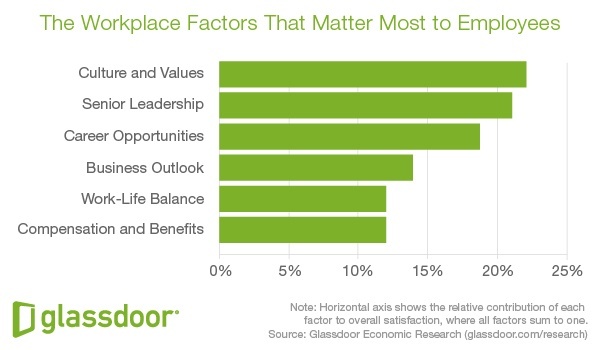 High-earning employees (those making more than $80,000 per year) view company culture and the quality of leadership as two of the biggest drivers of workplace satisfaction. 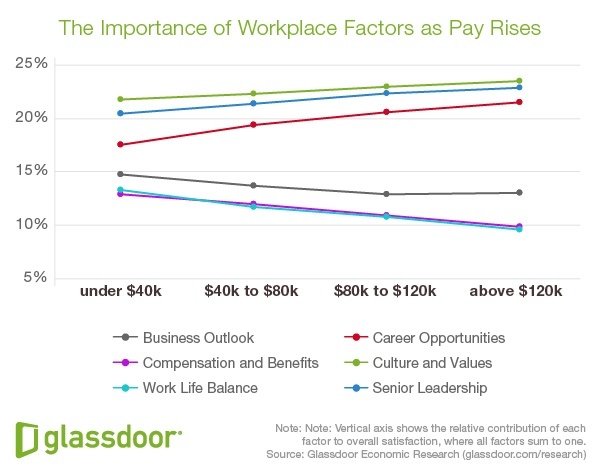 Glassdoor’s survey concludes that higher pay might help you attract employees, but retention requires long-term investments in your culture and senior leadership. Align your culture and strategy. The two should be interwoven and symbiotic. Focus on the strengths of your culture. No company is great at everything. Emphasize and prioritize what your company excels at and what your people value. Adopt a bottom-up approach. Your culture should be based on and shaped by employee feedback. Ask your people what matters to them and what they would like to change. Measure culture evolution. Monitor indicators such as business performance, employee sentiment and the health of key relationships with clients and vendors. Make learning a part of your culture. Lack of career advancement is a primary cause of employee turnover. Offer access to courses, training and mentorship programs. 2. Give your people meaningful, challenging work. Employees like a good challenge. A survey by LinkedIn and 4A found that 50 percent of departing employees at agencies left because their work wasn’t challenging enough. In the airline industry, for instance, companies that create opportunities for more meaningful work tend to have more motivated employees and routinely outperform their competitors. Play, such as when the work is so enjoyable that it doesn’t feel like an obligation or burden. Curiosity, experimentation and freedom to innovate are tied to play. Purpose, or when the work aligns with your personal identity. For instance, if you believe in doing social good, work that ties to that objective will have a stronger purpose for you. Potential, or when the work could benefit your identity. For example, if you’re aiming to be a senior marketer at an agency, any work that focuses on more advanced marketing tactics will appeal to you because of its potential. By contrast, if your employees are motivated by financial pressure (“I must do it because I need the money“) or emotional pressure (” I must do it because my boss asked me to“), they are less likely to find the work meaningful. Give employees free time and resources to pursue new ideas. Think of Google’s “20 percent time” rule or W.L. Gore & Associates’ giving employees access to company facilities for experimenting with new products. Let workers design their own processes. Employee-led processes can often be more attuned to their needs than manager-led approaches. Share results and outcomes. Show workers the fruits of their labor. Make team roles more fluid. Give people the freedom to “play” with different tools and approaches, and consider letting employees spend time working with other departments. Encourage curiosity, create challenging opportunities, and imbue your team with a sense of trust to improve workplace satisfaction. 3. Pay for performance, not profit. You already know that how much you pay employees has a direct impact on their job satisfaction. How you pay them is also crucial. According to a study of 13,657 employees, when pay is linked to performance, overall job satisfaction and trust in management increase. However, when pay is linked to company profits, there is no equivalent improvement in job satisfaction. In some cases, it even deteriorated trust in senior management. A common practice in smaller companies is to give employees a sense of ownership by offering company shares. However, the above study found that share ownership had a negative effect on job satisfaction. Another study found that performance-linked pay schemes are particularly effective for employees who are risk-oriented or have direct control over their own performance. It might not work for all your employees, but in departments such as sales or marketing, performance-linked pay structures could help boost engagement. What’s the easiest (and cheapest) way to improve workplace satisfaction? Let your employees work from home. People who work remotely tend to be happier and more efficient. However, remote workers often struggle to form strong relationships with their colleagues. Overall job satisfaction, however, is enough reason to offer more flexibility. Instead of asking everyone to work remotely, make it optional. Give employees the freedom to come into work if and when they want to. 5. Give employees a sense of ownership to spur engagement. An annual Babson College report on global entrepreneurship routinely finds that entrepreneurs are among the happiest people on earth, especially in terms of work satisfaction and engagement. Fewer than a third (31.5 percent) of U.S. workers say that they are “engaged” at work. Most are either not engaged (51 percent) or actively disengaged (17.5 percent), according to Gallup. The takeaway is that people who have a sense of ownership in their work are decidedly happier on the job and more engaged. How do you make that happen? Try offering physical ownership of personal space, as well as intellectual ownership of ideas and initiatives. Research shows that employees perform better when they can control their physical space. Power over how, where and when they work is tied to job performance and satisfaction. Job satisfaction is also linked to how employees feel about their working space. In one study, employees who were asked to treat their cubicles as if they “owned” it reported feeling more satisfied than those who “rented” it. You can put this into practice by encouraging employees to decorate and customize their working space as they wish. If your budget can accommodate it, consider giving them their choice of office equipment as well. Employees who can claim “ownership” of an idea, initiative or project show a greater sense of job satisfaction and initiative than others, research shows. This means giving employees the freedom to pursue ideas and passion projects. Plenty of agencies are “open” to feedback and ideas from employees, but few actually put suggestions into practice. If you can do so, that’s a great way to boost engagement. A version of this post first appeared on the Workamajig blog.